Newsflash - We judge & present William Hill's £1000 'Best Nessie Sighting of the Year Award'! Welcome to The Official Loch Ness Monster Fan Club. 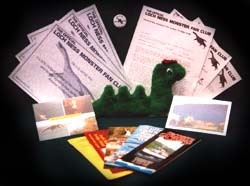 If your searching for information about Loch Ness & Nessie, then you need to join Nessie's official and exclusive club! Nessie News - NEW in 2000! Why not JOIN NOW! - without delay! If it's facts and information you're after, then you need the club's exiting Project Support Package. Packed with all the information you ever needed to know about Loch Ness and Nessie - Ideal for student projects and general research into Loch Ness. Indivdual Membership Certificate With Your Unique Membership Number. Highest Quality Nessie Souvenir Made Right Here in Scotland. This is the club devoted to Loch Ness, Nessie (its famous monster resident) and her millions of fans around the world. Annual membership costs a small sum of money to help with these pages, regular updates and our administration regarding members newsletters etc. The club is open to everyone - UK and NON UK residents. If you'd like to join, why not use our membership section or use our print and post form for your membership pack. You can sure that the club pack - plus future newsletters - will be winging their way towards you straight away! You can also help out by sending us your thoughts and feedback through our Questionairre, it helps us with these pages and our newsletters. The club maintains lists of sightings and contributes to those held on the Nessie on the Net! website. It is a focal point for local residents and visitors, whether they have seen the monster or just want to find out more about her. Like to get in touch? Simply email the President. WARNING! We have found some extremely dodgy looking imitation clubs out there - help us stop them from stealing Nessie away from her real home in Scotland by joining up today. The Official Loch Ness Monster Fan Club is based by Loch Ness, Scotland. The Club is owned and run by local people who really care about the well being of the world's most famous beast...Nessie!